My grandfather led me to wine at age three and I didn’t even have the courtesy to thank him.1 Astounding vistas on the world opened up to me that day and I have never looked back. Thanks to my grandfather’s foresight, caring and immeasurable love, this precocious exposure made the vine take root within me, and I went on to become a wine collector and tourist. When the cyclists of the Tour de France pass a celebrated vineyard I develop a terrible longing. I then pray more than when they pass cathedrals. 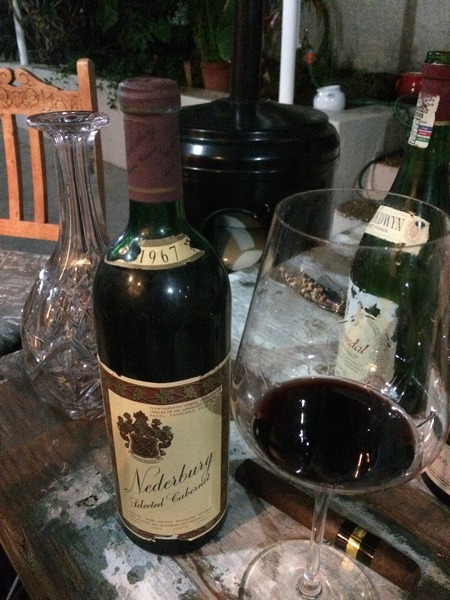 Although not drinking all that much these days, I still have a well-stocked cellar that has been an immersive pleasure to me over the years.2 I have also been lucky to have amassed a reasonable wine collection in my peregrinations as a wine tourist. As tough as it is to assemble a cellar, the challenge is not the stocking thereof, but the arrangement and classification of its wines. 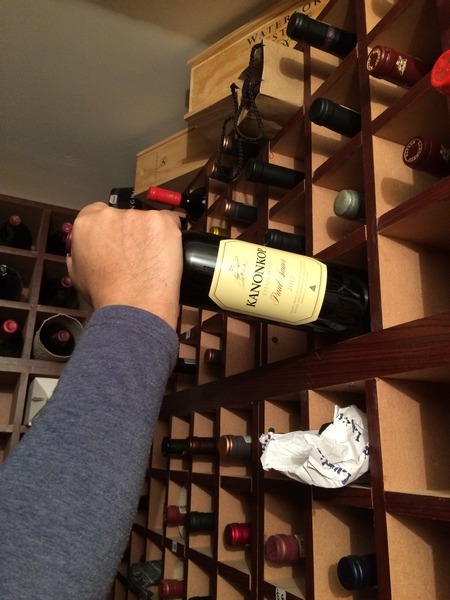 This is an easy enough task when the wine collection is small, up to say 300 bottles or so, but once it exceeds a certain critical quantity, more systematic classification is needed. The mix-up starts when some of your cellar’s storage areas, initially reserved for particular varietals, get full and you buy more wine. For lack of space, the new bottles tend to be dispersed into spaces which are available but incorrect locations for the new wine. You hope it is a temporary measure of which you can keep track but on your next Winelands excursion you buy even more wine.4 Before you know it, your cellar is a Tower of Babel of Bottles in which a wine can only be found after the prolonged echolocation of your frustration. This is where the ancient and noble profession of the cellar master comes in. The great mansions, palaces, companies and even colleges of the world have hired cellar masters to mind their precious stocks. The art is to manage a collection of wines so that each bottle is drunk at optimal maturity.5 The optimal age to drink a wine can range from a few months for a crispy young white to decades in the case of a great vintage port. 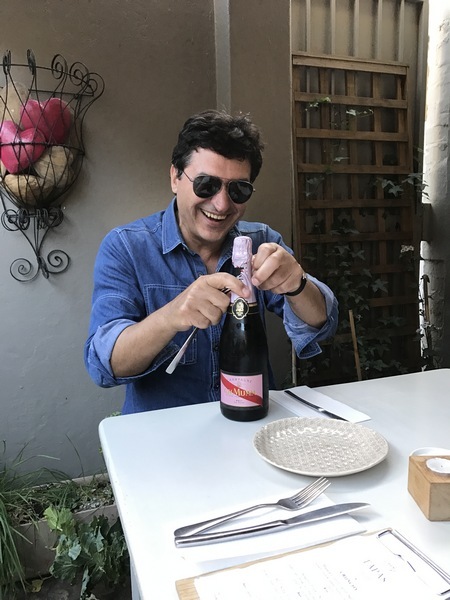 Optimal drinking age is assessed by knowledge of the wine and the maturing potential of previous vintages, but is ultimately determined by opening a bottle of the particular wine around its assessed optimal maturity and tasting it. Nice job if you can get it. Alas, my means have not allowed for the exclusive employ of a cellar master, so I’ve had to step in myself. My system has been haphazard although not without method. There is a small cellar in which I keep my better wines. Each bottle has its pigeonhole and for a long time I kept track of this by computer. 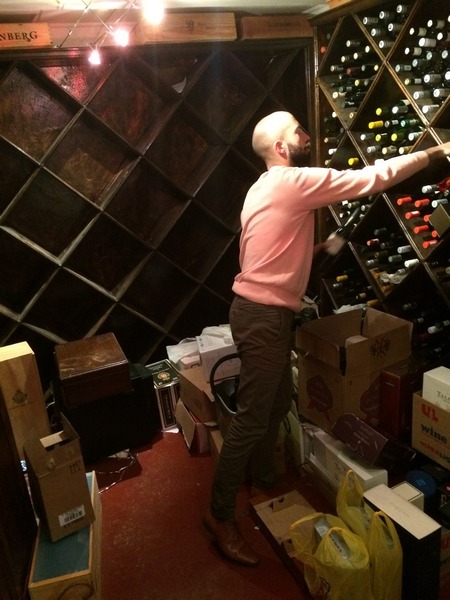 The larger cellar has diamond- shaped storage areas which are not ideal for cataloguing.6 Through the years my system had become looser, so that a few weekends ago, after a year of intent, Kyle and I finally set about rearranging my cellar. Now, how to rearrange the wines? We decided on a few broad categories. First, because people are more important than wine (ahem, yes), was a category called ‘gifts’. 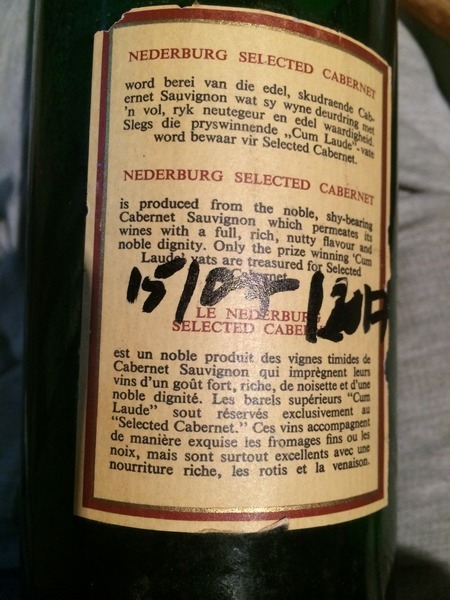 Whenever someone gives me a bottle of wine, I write their name and the date on the label, and years later, on the day I drink it, I give them a tinkle to report on their wine and remind them of the gift date, which invariably occasions a stir. 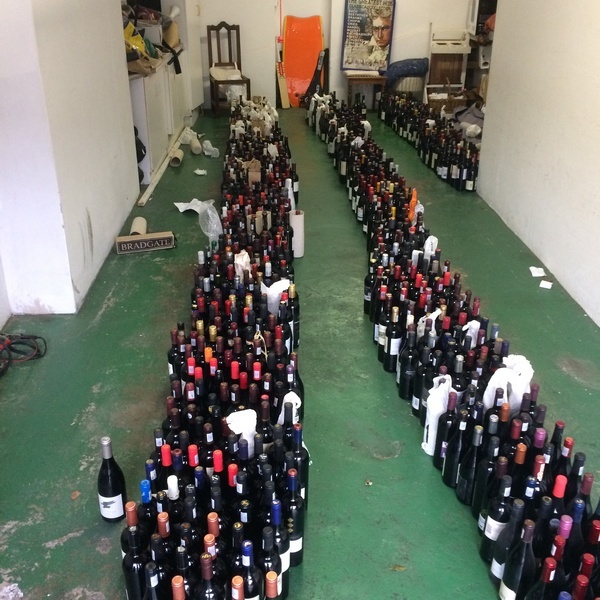 People tend to give me wine, and as I no longer drink that much nowadays, we set 153 gift bottles aside!9 The other categories were, broadly, Whites, Rhône-style wines (Shiraz etc. 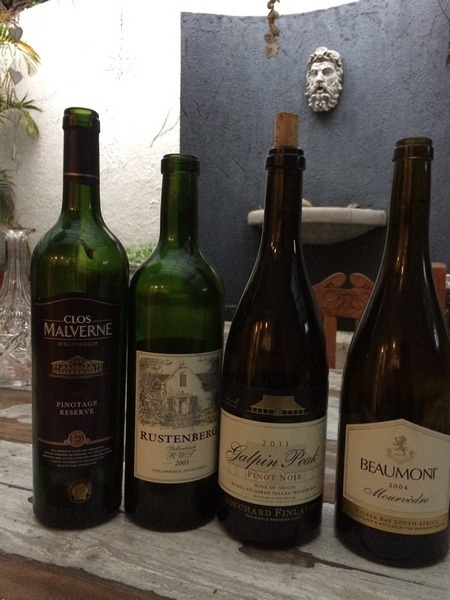 ), Burgundy (Pinot Noir), Bordeaux (Cabernet, Merlot etc.) Italian (Barolo), Pinotage, Unusual Varietals (e.g. Cinsault, Zinfandel, Tinta Barocca etc. ), Sparkling wines, Fortified wines and non-South African wines. There was also a not insignificant ‘Dubious Wine’ section, from which I’ll choose wines to serve to the likes of Graham. This took quite some doing – it’s a job going through 1500 bottles. The next morning I woke up Kyle with a little pick-me-up in bed, Jeeves style, to encourage the throat so to speak. The pick-me-up came in the form of a non-vintage Pierre Jourdan Ratafia from Haute Cabrière Estate in Franschhoek that had been bumbling on a kitchen shelf for years. There was no vintage on the bottle but the year of the Estate’s establishment was proudly emblazoned – 1694. Just what he needed to get him started. He immediately slid into an early morning sparkle and oozed that it was his best wake-up call ever. At that point, Kyle’s thirst really took over. 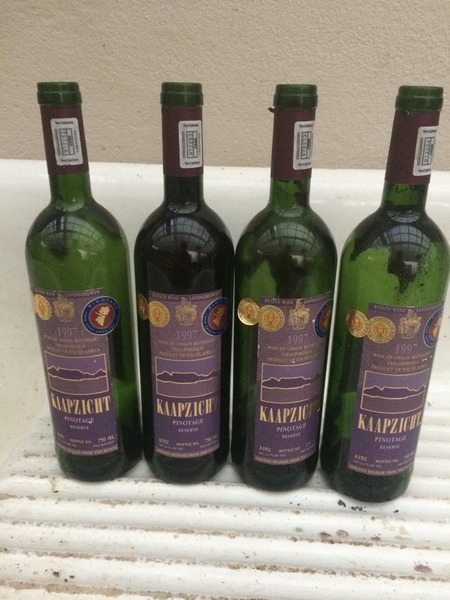 We romanced the rest of the day imbibing my finest, including four bottles of 1997 double-gold Kaapzicht Pinotage, the ‘buzz wine’ of that year. Kyle ‘giddy-aunted’ a lot, a lot. With acknowledgement to a similar quote by W.C. Fields, but true all the same. My cellar(s) were fitted out in 2003. There is a smaller one containing 640 pigeonholes for 750ml bottles and 120 pigeonholes for magnums. The larger cellar has more varied wine (everyday drinking, cooking, fortified wines, sparkling wines as well as liqueurs and spirits). It also has a keyboard and a CD player. My wines respond very well to baroque music, especially JS Bach. Otherwise they ask for untroubled, cool, dark quiet, thank you. The latest from Graham: After I had recently confessed to a slight weight gain, he recommended that I not bother to look for a bigger size of jeans at Levi’s, but that I wobble to a fitting at South African Tent and Tarpaulin instead. Isn’t he just the worst? I must have had 1800 bottles at the peak. There are probably 1500 bottles today. The gardener once helped me carry a box into my cellar and gaped. He asked whether I conducted business with all those wines. I had the heart to say yes. Truth is, I’ve never sold a bottle of wine in my life neither do I intend to. Optimal drinking age differs from wine to wine, and depends on the style of wine, its terroir, its tannic and acidic structure and on how well it has been wooded among other factors. 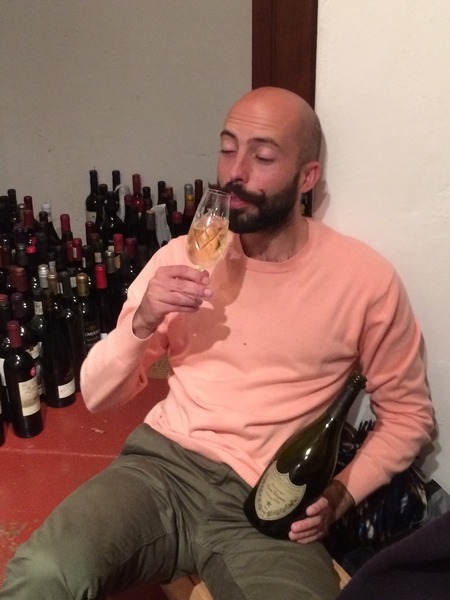 It’s as disappointing to drink a wine before it reaches its prime, when it is harsh and unsettled, as it is to drink it when it has passed its prime, all flabby and perhaps even oxidized. 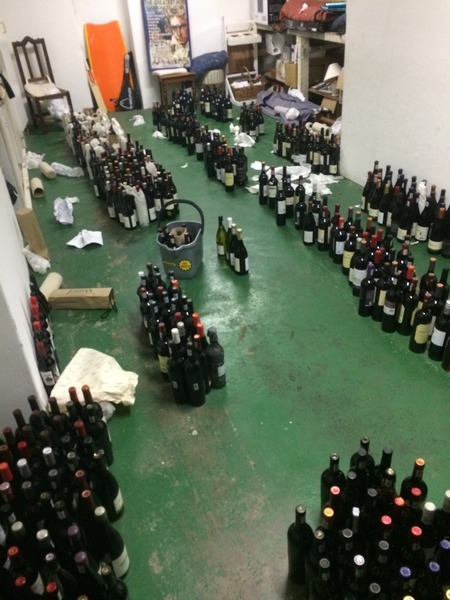 The wines in the smaller cellar were catalogued on computer, being in a grid, essentially in pivot tables in MS Excel. This, whilst sound, is not ideal as you have to cross reference and consult, besides, one must have the time to enter and delete entries. 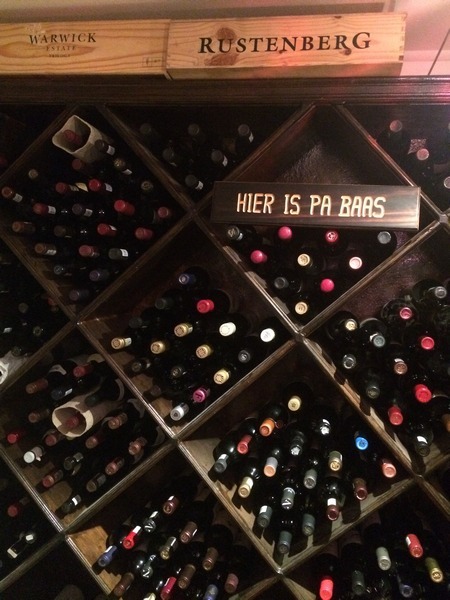 Also, it is best to go to an area of your cellar that stores the type of wine you want. You can have the tactile pleasure of handling and selecting a bottle from among its similarly positioned cousins. 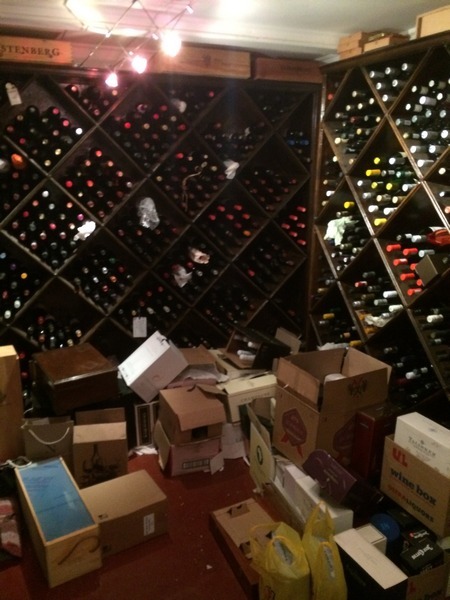 The storage spaces in the larger cellar are diamond-shaped boxes each holding two dozen bottles or so. This is not ideal as you have to sift through most bottles in the compartment if you want the bottle at the bottom of the “Vee” of the diamond. If you’re thinking of starting a cellar, avoid this configuration. 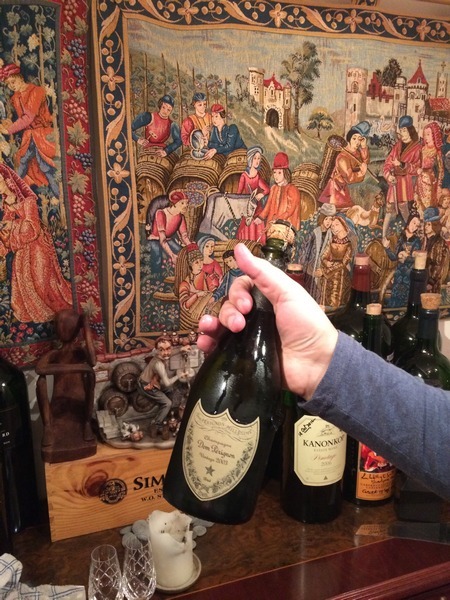 Dom Pérignon himself allegedly first said it when he tasted the champagne he had made by accident. So the nuttiness had been there from the beginning. What is remarkable about that is that nuttiness is a tertiary quality of wine, which develops over time. 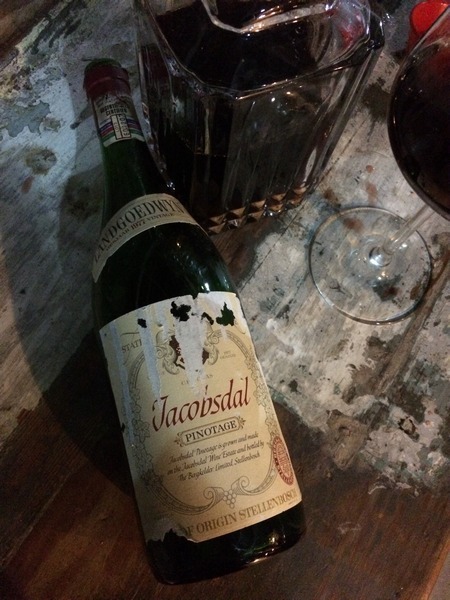 To have detected it in 1967 as a young wine must have been quite special. Let’s clarify a little here: A wine’s primary flavours are those considered to come directly from the grapes. If you consult a wine flavour wheel such as the one at http://winefolly.com/tutorial/wine-aroma-wheel-100-flavors/ you will see that it encompasses flavours as varied as fruitcake, Boysenberries, beeswax, potpourri, elderflower, Asian-5-spices, slate and volcanic rock. Ever tasted a volcanic rock? But there it is. Secondary flavours are what comes from the winemaking process – fermentation, malolactic conversion, the influence of oak and include mushroom, lager and sourdough tastes. As wine ages, various chemical conversions occur which produce many new chemical compounds, of which over 2000 have been found in wine. The primary flavours tend to move to the background and new notes emerge (e.g. Kyle’s complex phenolics). These are tertiary qualities and include vanilla, cigar box, leather, mushroom, truffles… and yes, nuts. Hence our surprise at the early detection of nutty flavours in the wine in its bottling year. Then of course there are wine faults, such as burnt rubber, boiled eggs, sweaty leather saddles, wet dog, musty cardboard, Band-aid and horse manure… In other words, specials reserved for Graham. Job well done indeed. 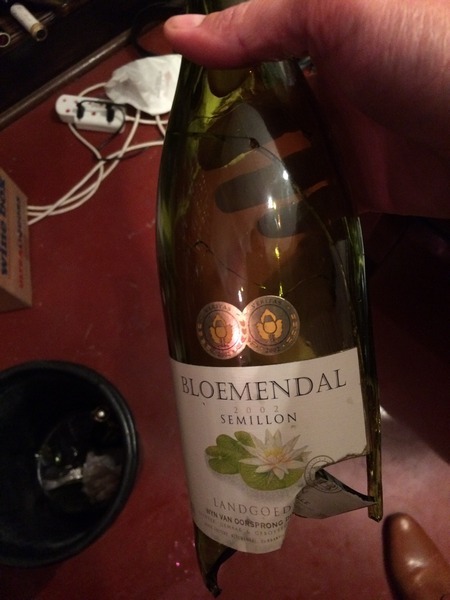 In all that shifting, we broke only one bottle of wine, a Bloemendal 2002 double-gold Semillon, ouch. We have yet to rearrange the ‘gift’ section into further subcategories for better management.